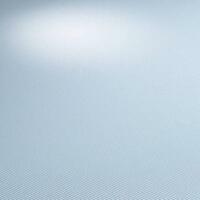 Total Capacity: 20.43 cu. ft.
Refrigerator Capacity: 15.29 cu. ft.
Freezer Capacity: 5.14 cu. 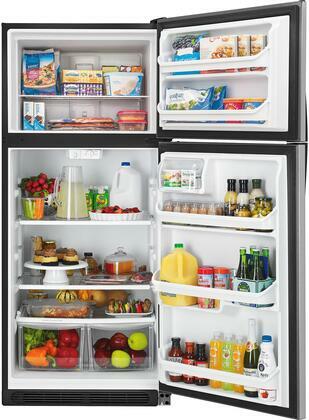 ft.
Fruit, veggies, milk, meat and more - store grocery orders both large and small in this refrigerator's spacious 20.4 cu. ft. interior. Slide-out, spill-proof glass storage shelves shift positions and can be moved quickly and easily, giving you space to store larger and awkwardly-shaped items. 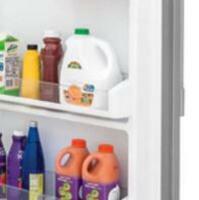 Designed to accommodate jugs, bottles and gallon containers, gallon-size door bins help clear the shelves so you have more space to stock up on even more food and grocery items. 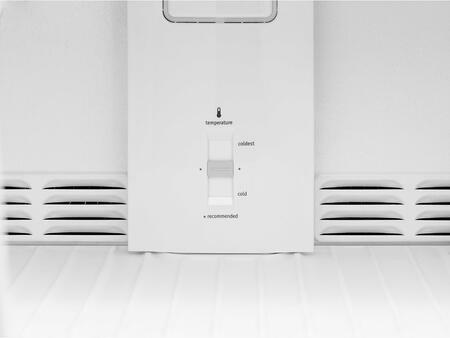 Constructed with a clean back design, this refrigerator takes a modern approach to performance by eliminating exposed consider coils that trap dust and lint. 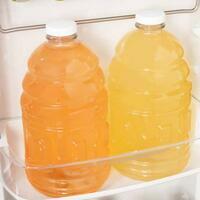 You'll spend less time cleaning and your refrigerator will function better than ever before. 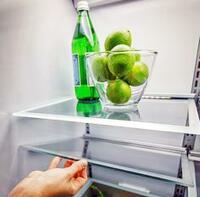 Enhanced lighting gives you a better view of what's inside your refrigerator. Not only will you be able to find your food fast, you'll also be able to make a quick note of what needs to go on your shopping list. 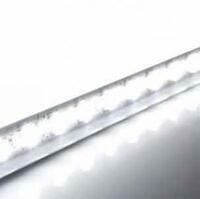 Bright white lighting from LED bulbs are energy efficient and offers elegant illumination throughout the interior. With a clean back design, this refrigerator eliminates exposed condenser coils that trap dust and lint, for less maintenance and better performance. Slide-out, glass storage shelves shift positions and move easily while delivering the support, visibility and airflow needed to keep food fresh and delicious. 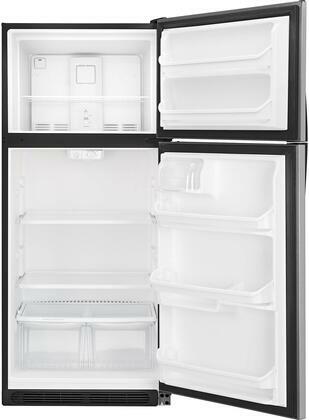 Depth with Door at 90 Degrees: 61.38"
This Freestanding fridge has something for everyone. 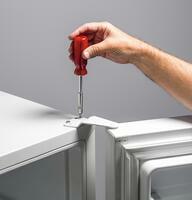 The Top Freezer design looks great in my kitchen and there are so many convenient features throughout this fridge. My wife and I like to prepare several meals for the week in advance so when we saw the huge storage capacity in this Kenmore refrigerator, we were intrigued. Paired with huge savings on AppliancesConnection.com, we are very satisfied with our purchase! 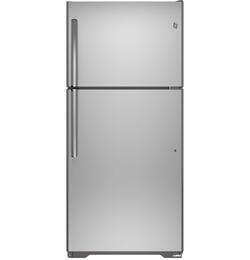 Found an awesome Kenmore appliance bundle that included this Freestanding Top Freezer fridge. I couldn't resist the deal on AppliancesConnection.com and I'm glad I didn't! 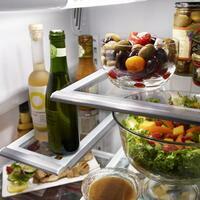 I love the crisper drawers on my Kenmore refrigerator. Everything I put in them stays fresh and tastes great. My old fridge was not sufficient at accomplishing this. Major Upgrade. We love our new refrigerator for multiple reasons. It`s large, has tons of space to store your food, bright and airy, functional and reminds you that you accidentally left the door ajar. My kids like the water dispenser and ice maker. My wife appreciates the beautiful color and how it makes the kitchen pop. My home office is relatively close to the kitchen and my previous fridge was so noisy and distracting. I replaced it recently with this Kenmore Top Freezer refrigerator and couldn't be happier! It's quiet, spacious and looks awesome! My dad is always trying to find fault with the kitchen appliances I buy. This Kenmore refrigerator is the first piece to leave him speechless he was so impressed. Thanks, Kenmore. My partner and I run an independent catering firm and bought this Kenmore refrigerator for personal use. It does, though, have to accommodate some overflow stock from our business (a LOT of it at times) and does so without fail. We'll probably buy another instead of going the professional grade route. This refrigerator is leaps and bounds better than my old one. The interior is huge. It gets colder on its middle setting than my old one did at its lowest. Operating noise? What noise? Can't believe I didn't make the switch sooner. Took a little longer to receive than I had been expecting but people on the line were so nice to help me out. Great customer service.